I realized yesterday that I have been afraid to say what I think. Oh, not about God. I could talk about God all day long, and I am definitely not afraid to witness for Christ. But I was on Facebook, and people were talking about all sorts of current political happenings, and there were some things I agreed with … but I was afraid to share them or comment openly. And then I realized why, and the why isn’t going to happen anymore. I was afraid to comment openly because I am Facebook-friends (not necessarily personal friends) with a lot of liberal people. People who scream buzzwords like “bigot” or “intolerant” and all sorts of other things whenever someone doesn’t agree with them. People whose insistence on “tolerance” only applies as long as you agree with AND ENDORSE their agenda. And I don’t agree with them; but I was afraid to state my opinions publicly because I didn’t want them to “unfriend” me or think badly of me. And that, my friend, is a problem. THAT’S how the Church arrived at the sad state it’s in right now. For too long, Bible-believing Christians have sat back and let everybody else have their say. We have sat back and shaken our heads, pitying those liberals who don’t believe and live out the Bible. But we have done so silently, and THAT is why “those liberals” have taken over our government and churches. Because Christians have said NOTHING. 1. The Bible is the inerrant, infallible Word of God. (This isn’t new, and it isn’t new for me to say so, either; but I just wanted to say it again.) 🙂 Everything in the Bible is true, and in it is found the ONLY truth. 2. There is only one way to God, and that is through Jesus Christ. 3. Abortion is WRONG. It is murder. Beloved, you MUST understand that we aren’t wrestling against the people who have been seduced by the enemy into believing the lies of Islam. They are precious people for whom Christ died. But make no mistake, world: the religion/political system of Islam is at war against the world. And if you don’t like the fact that I said that, you can unfriend me, unfollow me, or unsubscribe if you need to. I’d hate to see you go; really, I would. I’m not unfriending you over your liberal statements that I disagree with. I find value and beauty in you, and in getting to know you, whether we agree or not. But if you need to disassociate yourself from me because of what I said–your choice, not mine, then do what you need to do. I would be sad if you did; and your doing so would indicate that you advocate tolerance, yet have none yourself. And if that describes you, then what you really are advocating is INtolerance; that your way is the only way, and that everyone has to think like you do. I hope you will stop and think about that. It sounds like a double standard to me. Doesn’t it to you? But from now on, I’m going to say what I think when I need to, on Facebook and every other place I feel led. That doesn’t mean I will always have something to say. But I am going to say it if I do, and not let myself be intimidated by the possibility that someone **might** disagree with me. That also doesn’t mean this is going to become a political blog. This site is not going to become a political blog because that’s not my life’s message. The message God assigned me for MY life is to preach the Gospel of Christ with power and to encourage, build up, and teach God’s people. But I’m not going to cower in intimidation before a few people with angry spirits over their liberal cause. And since Jesus is coming back for a pure and spotless Bride, and since He has promised the biggest outpouring of revival in history before He comes, maybe, just maybe, I will find that my voice is louder. And if you’ve been cowering too, maybe it’s time to find your voice again and be louder with me. 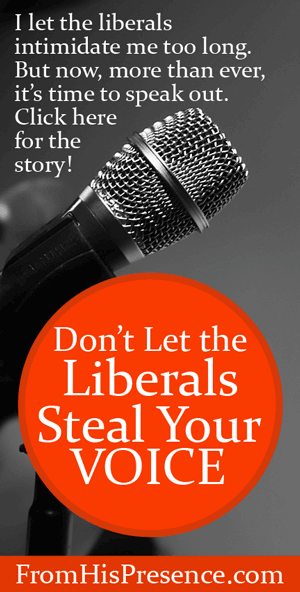 Don’t let the liberals steal your voice. Now, more than ever, it’s time to speak up. Does this resonate with you? Have you been letting fear or intimidation steal your voice? If so, leave a comment below! I was hesitant about posting verses on Pinterest but I loved it, and now I have a blog. I’ve had only three people disagree and two of them read it wrong, one even apologized. I’ve stayed away from Facebook but may venture there. I know religion and politics are touchy subjects, you can’t welcome people to a free country and then, discriminate. But we should be able to defend ourselves from terrorists. And though I don’t agree with Hillary Clinton, and Benghazi was a nightmare, she’s highly qualified to be President, one thing I heard her say was that Jesus remembers sin no more, and that’s true,but people do and He does expect you to quit repeating it. Here it is Jaime, it’s mostly pictures, poetry, like my Pinterest board, I wanted to encourage women to rely on Jesus. This connects to a poem I wrote about the orphan spirit. https://adaughtersgiftoflove.wordpress.com/ Try this one, poem isn’t coming up. Rebecca, I am curious as to why if you do not agree with Hillary, you are choosing her for POTUS? I’m assuming that is what you meant when you said you believe she is qualified for the position? It seems you are saying that even though you wouldn’t choose her because you disagree with her you’ll vote for her anyway? And that is what I’m curious about – what is it about the other candidates that rules them out and puts her, someone you disagree with, on top? I will try. Even after posting this post, I felt like I was shaking in my boots at the possible repercussions! Oh well… help me Jesus! Amen and Amen!! Agree 100%, Jamie! I’m also through with being silent! Shared this with friends and family…my husband liked it so well he shared on his FB page and some other forums. 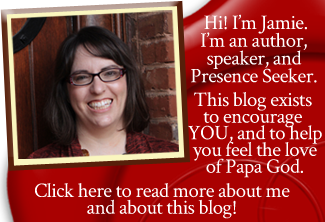 There has been an overwhelming positive response to your words and your blog!! May God continue to bless you with the courage to speak the truth in love! Amen! Thank you so much for all the shout-outs! I really appreciate it, and I receive that blessing! Amen Jamie! I agree with you!!! I pray I will have your boldness and speak out the truth in love. I believe with your “coming out” that you will encourage others to do the same. I appreciate you and the time it takes to do all you do for the cause of Christ and getting the Bride of Christ ready!!! I agree 100 o/o with you! I too have allowed myself to be silenced because I was afraid I might hurt someone’s feelings or offend them. I’m like you, if they want to they can cut me loose. Great post!! Jamie, I agree with you 150%!! I too, used to just be quiet. Then I’d state my opinion, that was based on God’s Word, only to be bashed by liberals. So, I ran to my corner and hid. But I decided, not anymore. Just like you did. I’m entitled to what I believe. That abortion is wrong. Lying and cheating is wrong. I’m pretty sheltered, so when I heard the guy running with Hillary as Vice President say he had an open marriage–I was shocked. I thank the Lord Above that we have a President who prays and has Bible study in the White House. I pray every single day for all of our leaders. Thank you for touching on this very touchy subject! Peace! Thank you for speaking for some of us. I felt the same way too. At work, everyone assumes that everyone hates our President. They’ll just start to bad mouth our President right on my face. But I’m afraid to say something, because some are really still angry until now for him winning. I only have one co-worker that believes the same way I do. I hope they’ll realize that my not commenting means I disagree. I can only pray!